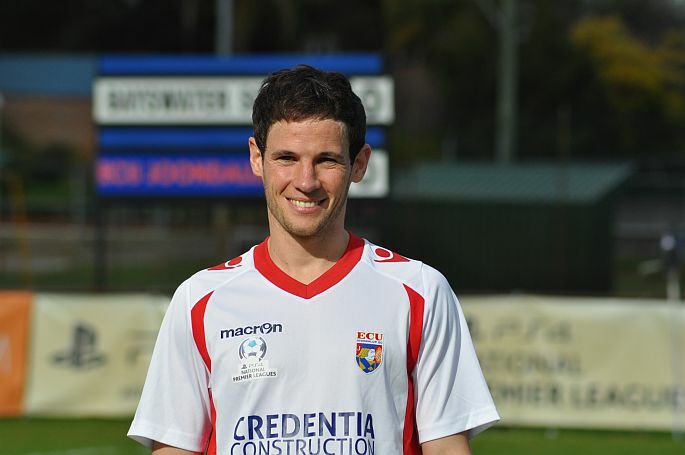 ECU Joondalup stretched their unbeaten run to 11 games with a come-from-behind 3-1 win against Cockburn City last week, with Scottish midfielder Kevin Moon outstanding in the engine room of the side. Along with Steven McGarry and Shane Pickering the former St Johnstone player challenged, chased, broke down their possession, and started many of the Jacks moves going forward, and was rewarded with the Credentia Construction Man of the Match. Moon, who was selected in the WA State side that played Perth Glory last week, but missed out due to injury, had to overcome that ankle injury to take his place in the side, and he said Cockburn troubled them early, but the team steadied to take the points comfortably. “Cockburn are not a bad team, and it shows in this league there is no easy game, and you have to be on your game each week. I thought the lads showed great character to hit back and the goal late in the first half got us back on track, but it’s another massive win for us,” he explained. A second half double from Gordon Smith took him to the top of the League goal scoring table, and Moon said the striker has weighed in with crucial goals in recent weeks, and he said their fate in their own hands now. “Yes Goggsie has had a few pressure penalties in the last few weeks, but he’s got big balls, and fair play to him he’s buried them,” he said. Moon said they fear no one in the league and will be going into Saturday crunch clash at Inglewood with just one thing on their minds – Three points. “Like I said there are no easy games in this league, we’ve rested up this week and have prepared for another huge game, but we’re looking forward to the challenge,” he said. “We’ve played the last five games with the same mindset – A cup Final – and we will be doing all we can to get the result to take us into the Top four Finals.” The Jacks take on Inglewood at the Inglewood Stadium, Hamer Parade, Inglewood – Kick off 3pm – Let’s get behind the Jacks – See you all there!!!! !